Aylesbury United were on the wrong end of an entertaining five-goal affair at Northwood on Saturday as they continued to stutter their way through the final stages of the season. The Ducks have struggled for consistency since the turn of the year and as a result have slipped to 13th in Division One Central of the Southern League with two games remaining. Saturday’s encounter had an end-of-season feel as both sides went into the game with little to play for, which made for an entertaining spectacle. United were without Shane Wood, Stacey Field, Bill Morgan and Jason Blackett, leaving manager Tony Joyce with a depleted squad and it seemed to show in the opening stages as Northwood began on top before going ahead on 12 minutes when some hesitant defending allowed Niko Muir to lash home a superb shot from outside the box that left Dan Green no chance. It could have been worse for the visitors eight minutes later when Muir skied an effort over, but Aylesbury showed good character and enjoyed an excellent spell of their own as Greg Williams saw his header cleared off the line before the returning Paul Edgeworth was unable to guide his header into the net. 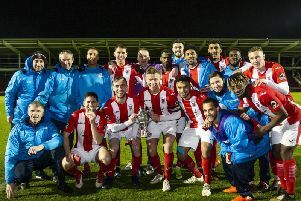 United continued to exert pressure on the home goal and it eventually told when, on the stroke of half-time, Joey Acheampong picked out Jordan Frederick, who swept home his first goal for the club. The Ducks picked up from where they left off after the restart and they duly went ahead less than a minute into the second half with Acheampong the instigator again. The visiting striker outpaced the home defence, latched onto a pass over the top and was unlucky to see his effort struck the post, but the rebound fell kindly for United with Edgeworth scrambling the ball over the line from less than a yard out. Aylesbury now appeared in the ascendency, but three second half minutes completely altered the complexion of the match as goals from Robbie Hastings and Perry Dicker turned the game around. As the visitors chased an equaliser, both sides had chances but neither were able to profit and the match ended in defeat for Aylesbury - their 10th away loss of the season. The Ducks host Beaconsfield SYCOB in their penultimate match of the season this weekend.